Two major factors figured into Parkway quarterback Brandon Harris’ decision to verbally commit to LSU on Thursday. He wants the chance to compete for the starting job as a freshman, and he wants his family to be able to come see him play without having to travel a great distance. Harris, a rising senior, made his long-awaited commitment Thursday afternoon in the Parkway library before dozens of family members, Parkway students, well-wishers and media. 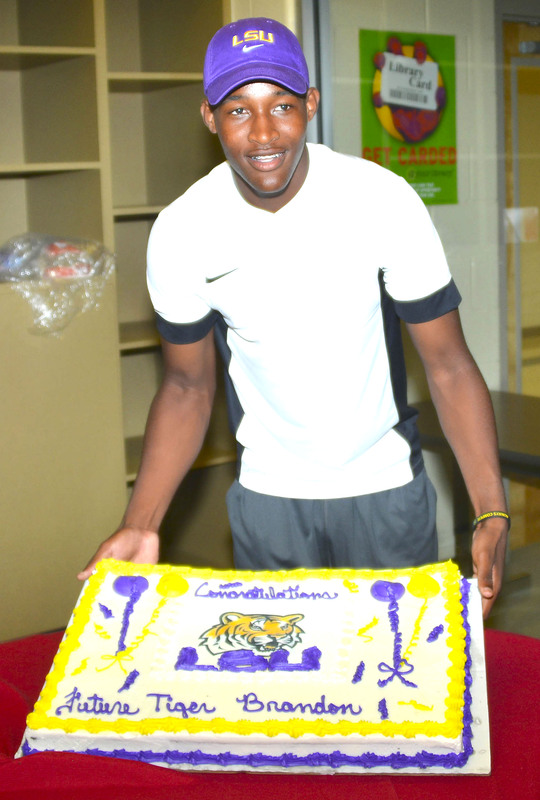 Parkway quarterback Brandon Harris celebrates after verbally committing to LSU Thursday. Harris plans to graduate in December and enroll at LSU in the spring. “Of course, everybody knows (LSU starting quarterback) Zach Mettenberger graduates this year so by me getting the opportunity to graduate this December and enroll early and go through spring practice I get a great shot at trying to be the starter as a freshman,” he said. Harris chose LSU over Auburn and Ohio State. He also got many other scholarship offers, including one from two-time defending national champion Alabama. His visited LSU, Ohio State, Auburn and Alabama. He said he felt most comfortable at LSU. “I was talking to my brother about it,” he said. “We went to Ohio State, we went to Alabama, and we went to all these other schools. I went to LSU May 26, a Saturday, right when we got out of school this summer. Another factor in his decision was the chance to play under new LSU offensive coordinator and quarterbacks coach Cam Cameron. Cameron is a former NFL head coach and offensive coordinator and has worked with several top NFL quarterbacks, including Drew Brees, Phillip Rivers and Joe Flacco. Harris said his ultimate goal is to play in the the NFL. “With his ability to coach quarterbacks at the highest level … I knew that’s where I wanted to be,” he said. Harris said he made his decision after discussing it with his family and after many nights of prayer. That his family will have to drive only four hours to see him play was a big factor. Among his family members present Friday were his father, Detroit, grandmother Gloria Harris, and brothers Detroit and Avery. Harris said he especially didn’t want to make his grandmother have to travel a long way. Harris said he informed LSU head coach Les Miles of his decision Saturday. While some observers thought Harris was leaning toward LSU throughout the recruiting process, he said he didn’t make his final decision until then. “You know that I feel like Louisiana produces the best athletes every year,” he said. “To get an opportunity to play with the greatest athletes and go into the Louisiana Hall of Fame one day. I know I didn’t want to go into the Alabama Hall of Fame or the Ohio State Hall of Fame. I want to go into the Louisiana Hall of Fame.